"cannot be touched". Software is also sometimes used in a more narrow sense, meaning application software only. Sometimes the term includes data that has not traditionally been associated with computers, such as film, tapes, and records. Computer software is so called to distinguish it from computer hardware, which encompasses the physical interconnections and devices required to store and execute (or run) the software. At the lowest level, executable code consists of machine language instructions specific to an individual processor. 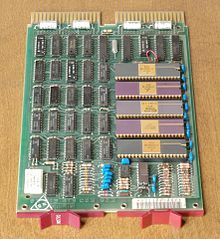 A machine language consists of groups of binary values signifying processor instructions that change the state of the computer from its preceding state. Programs are an ordered sequence of instructions for changing the state of the computer in a particular sequence. It is usually written in high-level programming languages that are easier and more efficient for humans to use (closer to natural language) than machine language. High-level languages are compiled or interpreted into machine language object code. Software may also be written in an assembly language, essentially, a mnemonic representation of a machine language using a natural language alphabet. Assembly language must be assembled into object code via an assembler.